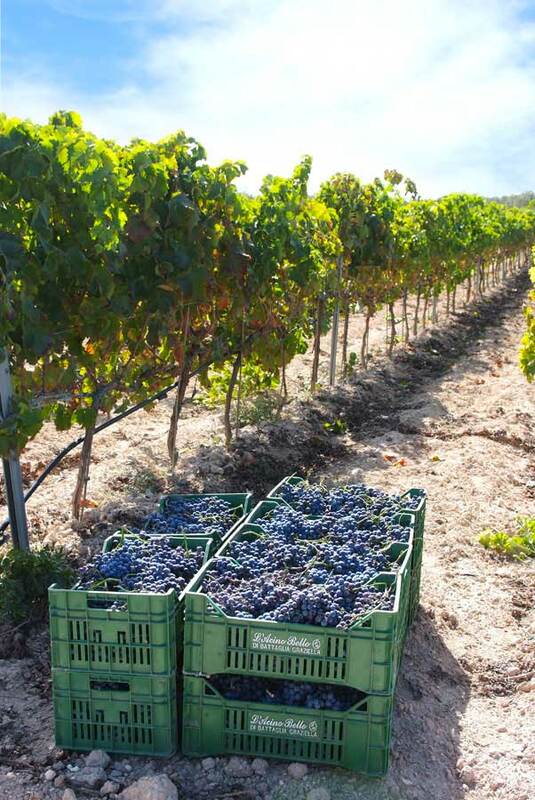 Nero D’Avola red grapes , also called Calabrese, are a very old Sicilian grape variety. It has always been grown on hillsides of the Hyblaean Mountains in the province of Ragusa. The second name attributed to it, that is to say Calabrese, is nothing but an Italiani-zation of a word in Sicilian dialect, Calaurisi, which is composed of two words, cala (a Sicilian word to refer to grapes) and aurisi (a Sicilian word which stands for the Italian Avolese and it means from Avola). Frappato red grapes produce a light bodied wine with a distinct grapey aroma. Vineplants are disbudded in order to have sweet and superfine tannins. In its purity, the wine is fragrant, fresh, with intense notes of bilberry, blackberry and raspberry. The palate impression is bright, fresh and persistent, with small black and red fruits coating the mouth at the same time. It is seen as a precious component of Sicily’s DOCG wine, Cerasuolo di Vittoria, DOC Vittoria red wine and Donna Grazia Il Bianco white wine. Cerasuolo di Vittoria red wine is the very first and only DOCG wine in Sicily. Of ancient tradition, It brings together two of Sicily’s most significant autochthonous varieties of grapes, Nero d’Avola and Frappato. Gurrieri vineyards, cultivated in accordance with traditional agricultural techniques, which were improved with the passing of centuries, to face a scorching climate without having recourse to irrigation, can provide a great variety of red wines that are excellent candidate for delight the palate.